We extend congratulations to Dr Tony Fischer, our ACT Coordinator who has been appointed to Chair the Independent Steering Committee of the WHEAT CGIAR Research Program (CRP), for which CIMMYT (The International Center for Maize and Wheat Research in Mexico) is lead centre. WHEAT works to raise the productivity, production and affordable availability of wheat for 2.5 billion resource-poor consumers who depend on the crop as a staple food. Tony headed CIMMYT’s wheat research program before returning to Australia to take up the position as manager of crops and soils at the Australian Centre for International Agricultural Research (ACIAR). He has published widely on wheat agronomy, physiology and improvement, and on agricultural development. 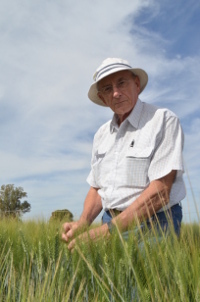 Tony has also served on several international boards as well as the Board of GRDC, and has won both the Donald and Farrer Medals and received an AM for his work. Most recently, Tony and two colleagues, Dr Derek Byerlee and Dr Greg Edmeades, completed a milestone book on global crop yields, addressing whether yield increase will continue to feed the world (https://aciar.gov.au/publication/mn158). It is expected to become a key reference book for agricultural scientists and economists, decision-makers in the food production industry, concerned citizens and tertiary students. More information on his CRP WHEAT appointment is available here.